At IBA we strive to provide our community with the opportunities they deserve. We believe that a clean and comfortable environment plays a key role in their quality of life, so it was very exciting to announce that after one year of renovations our community spaces were inaugurated on July –. Through these spaces, we will continue providing resident services, youth and workforce programming, activities for elders, and technology classes in the South End. We held a ribbon cutting ceremony to celebrate this important milestone joined by Mayor Martin J. Walsh, funders, sponsors, residents and other elected officials. “Projects like these keep our city vibrant, safe and our community empowered,” said Mayor Walsh during the ribbon cutting. He also recognized various residents who have been highly involved with the community and spreading a positive impact throughout the neighborhood. The renovations not only made our spaces more beautiful, but more efficient to address the needs of our community. They will host the following programs: Resident Services, Youth Center, Technology Center, Community Room, Security Offices, and Laundry Facility. “We are excited about reaffirming our organizing values by bringing these community spaces to a new life”, shared our CEO Vanessa Calderón-Rosado. “These spaces are energy-efficient as well as more functional and flexible for the growing demands of IBA’s programs; and of course, they are so beautiful!” added Calderón-Rosado. Everyone was part of the project; residents as well as staff were engaged in the design process. But, it isn’t over yet. In August, we will start the next phase of the renovations, which will include common areas on the residential floors above the 100 West Dedham Street community spaces. 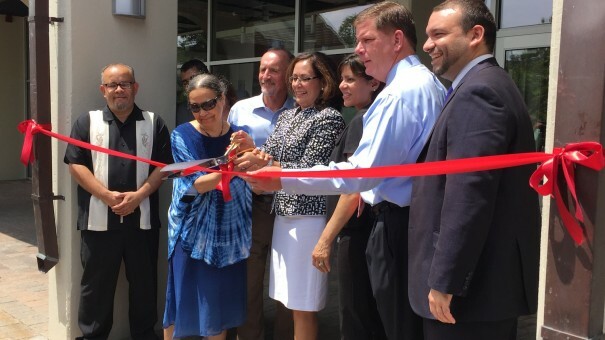 After all the official messages, CEO Dr. Vanessa Calderón-Rosado, along with Mayor Walsh, and several board members cut the ribbon, marking the official opening of the renovated spaces. All those in attendance were invited to see inside the building where a band composed of our own Villa Victoria residents was waiting with lively traditional music and refreshments. Everyone danced as we celebrated this new chapter in our community.